As part of my love-hate relationship saga with award shows, I decided to summarize my feelings after last night’s ceremony. I think we can all agree that Mr. Robot is one of the most innovative, edgy, brilliant pieces of television to grace our screens lately. So I am incredibly glad it was recognized as such. I am also thrilled Taraji got the Golden Globe since Viola already won the Emmy. I still think Empire – despite its popularity – is very soapy and not as good as the other dramas. However, Taraji’s performance is excellent. So good for her! Now I have a confession: I’ve never liked Maura Tierney. I am not sure why… Yet, I have to admit that her work on The Affair has been great. Since the show now incorporated four different POVs, Maura has been getting more screen-time and has tackled quite a few difficult scenes. 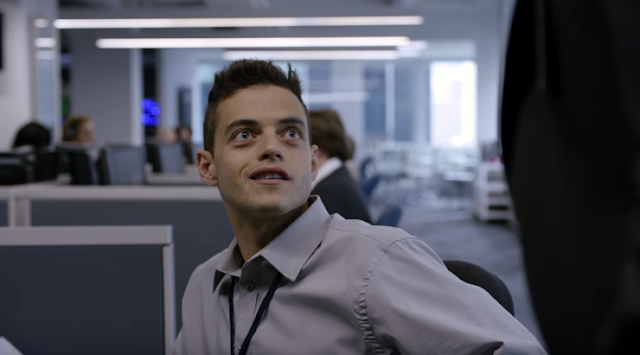 I am a bit disappointed that Rami Malek didn’t win. Without a doubt, he deserved it. But… this is the first year of Mr. Robot and I am confident he will win eventually. On the other hand, it was the farewell season of Mad Men. 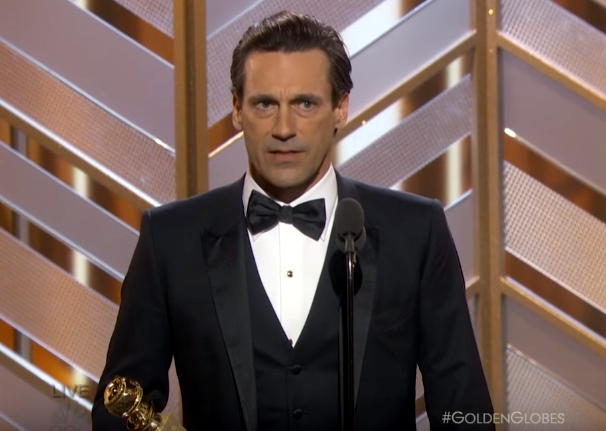 So I understand the sentimentality behind wanting to see Jon Hamm take the trophy [and give us some eye-candy]. Plus, they gave the supporting actor award to Christian Slater. So all is good in the world. Honestly, now that I am officially tallying things up, looks like I agree with most of the voters’ choices. However there were a couple that made me roll my eyes. The first one being Wolf Hall. I watched that show, it was an interesting twist, well-acted, well executed, shot in the actual castle where Henry VIII lived. So I am not saying it was bad at all. Nevertheless, if you examine the other nominees on this category you would see that Fargo is there. I thought a win for Fargo was a given. Is there an unwritten rule that this category has to go to a British show? Same goes for Rachel Bloom. Unlike some past winners, I don’t dislike Rachel. I didn’t think much of the show. But she was OK. But this category included actresses like Lily Tomlin and Jamie Lee Curtis who were not just “OK”. They have been amazing. But fine… let’s say they want to celebrate “new talent”. The Golden Globes tend to do that a lot and it is not a bad thing. But here is what bothers me: The CW was never in the running for anything, but suddenly these sugary comedies are getting massive attention. They are not bad, but they are hardly the best of the network. It seems unfair that a show like The 100, which has been consistently delivering in terms of storytelling would never even be considered for awards like this. And if we are going to talk comedies, iZombie has the greatest tone and dialogue the CW can offer. But let’s be real… they will never go with the zombies. Now I am afraid that this award is going to score a renewal for Crazy Ex Girlfriend. And that just means taking the spot of another show. I, for one, could live without CEG [most people agree, judging from the ratings]. I have not seen Mozart in the Jungle, so no idea if it is good. What I find interesting about this is that this show was basically non-existent a year ago. But now it is the awards’ darling! Can we assume that voters finished watching Transparent and then decided to fill their “showhole” with Mozart? Man… what a winning show can do for a streaming platform! Can they start watching Catastrophe now? Next year big winner, anyone? Similarly, I don’t watch AHS, not my genre. So I wonder: is Lady Gaga really this good? Better than Kristen Dunst and Felicity Huffman? She is certainly getting a LOT of attention.